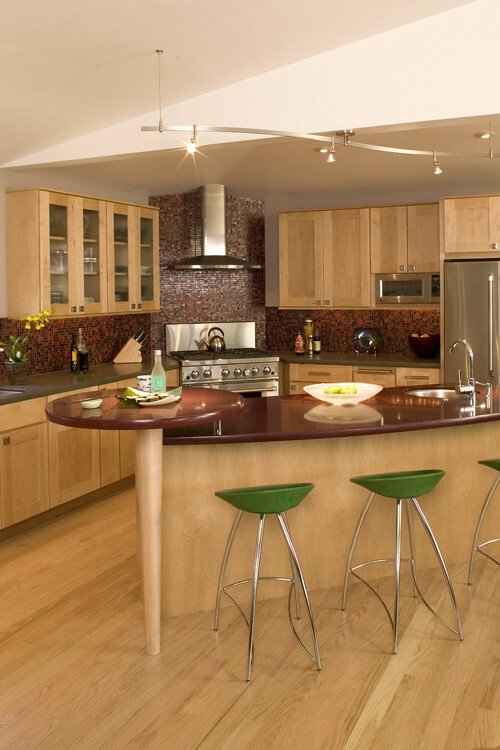 The possibilities of changing the style of your kitchen are endless when you incorporate the use of barstools. Whether you opt for traditional, comfort, modern, or a combination, you can reflect your personality and even bring functionality to the space. 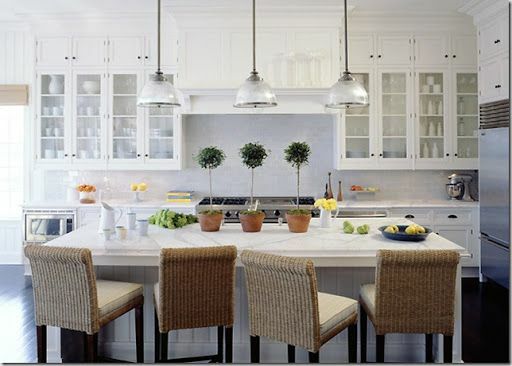 Whether you’re a family of one or ten, you can add a sense of elegance to your kitchen with barstools. The barstools used in this example are just what this kitchen needed to enhance the already stylish island, back splash, and antique white cabinets. Opting for backless barstools allows the space to feel open and welcoming. 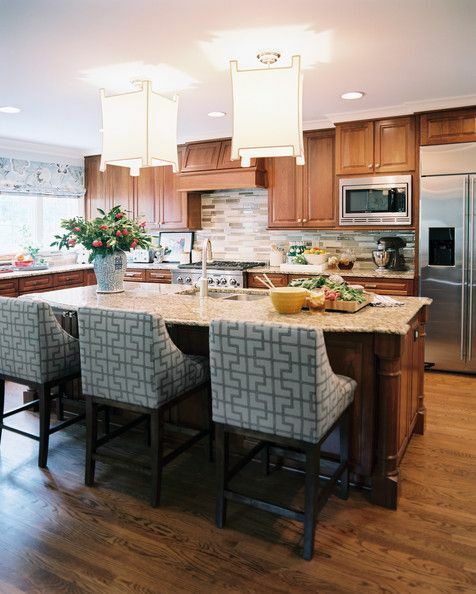 Notice how the color of the legs of the barstools match the lighting fixtures and cabinets handles. That’s a great way to bring the look together when you’re unsure of how to match them to your existing colors. You don’t have to remodel your kitchen to achieve a contemporary look. In this example, just adding this style of barstool in combination with the trendy green color, has taken this kitchen from normal and neutral to modern and eye-catching! No matter what style your kitchen is, the look and feel of comfortable barstools will be a welcomed replacement (or addition). In this example, the neutral fabric is able to stand out against the overall whitish look of this kitchen. Doesn’t it just make you want to sit down and converse with family and friends?! 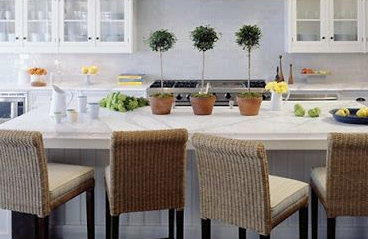 The right fabric pattern on your barstools can be just the finishing touch your kitchen needs. 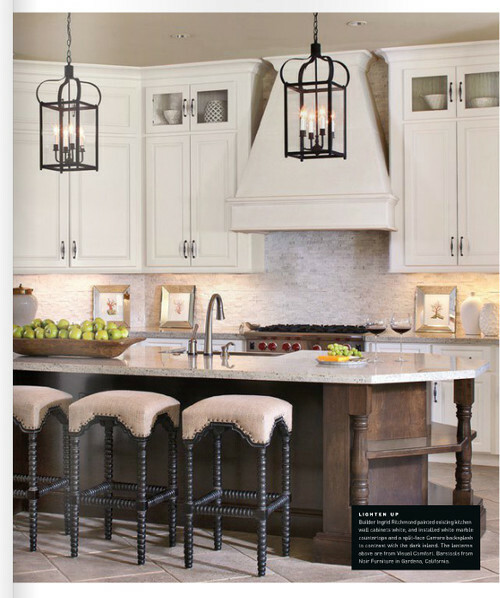 In this example, the pattern mimics the rectangular design of the back splash as well as the oblong design of the lighting fixtures over the island.